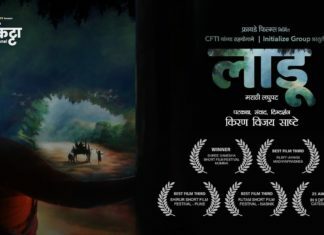 Katyar Kaljat Ghusali, a milestone play in Marathi theatre has been made into a film by Subodh Bhave. The play which has some unforgettable classical songs by Pandit Jitendra Abhisheki, and which took Marathi theatre by storm with his and Vasantrao Deshpande’s memorable singing will be seen on silver screen this time. The teaser trailer for this film has been released recently on social media, and we are blown away with the epicness of this film. The huge sets, lovely costumes and amazing star-cast have been making us beg for more. The story about two classical singers and their enmity between two gharanas is the plot of this film. Music is most important part of this film. The song “Ghei Chhand Makrand” by Pandit Jitendra Abhisheki has been rendered by Shankar Mahadevan for the film. What’s more! Shankar Mahadevan will be seen in the role pf Panditji in the film. That is really epic! The crucial role of Khansaheb has been done by Sachin Pilgaonkar. This legendary actor is known for his various roles, however, very few are aware of his classical singing and chaste Urdu speaking. Subodh Bhave, apart from directing this musical drama, will also be seen as “Sadashiv” in the film. After watching him in Balgandharva as a classical singer, we are sure that Subodh will nail this role effortlessly. Rest of the cast has also some exciting actors. Amruta Khanvilkar as Zareena, and Mrunmayee Deshpande as Uma are really good choices. Hindi TV actress Sakshi Tanwar will be seen in the role of Nabeela, this will be her first Marathi film. The film is produced by Nitin Keni and Essel Vision. The music is by Bollywood superhit musical trio Shankar Ehsan Mahadevan. The film is scheduled to release in Diwali. We are sure this Diwali will be awesome musical extravaganza for Marathi audience.